San Antonio continues to submerge itself with ongoing international opportunities now exposing their film scene with engaging followers who are contributing to the crimes of guerrilla film street culture. Now more than ever taking over underground film to make an exception for experimental nurtured film that is now fleeting Hollywood. Experiencing all walks of films to be shown at the comfort of your own pocket phone, internet streaming twenty four hours a day a film festival for pop audiences. Made available for seven days starting April 1st Fools day through the 7th enfolding to the public a film viewing open to all for world wide critiscsm and notable eyes. 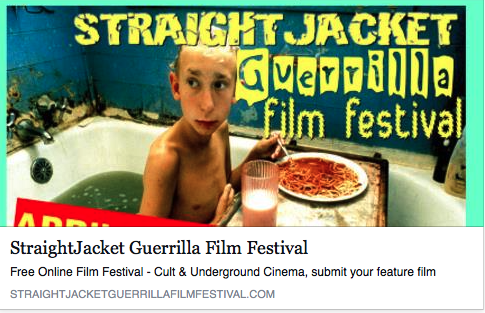 The Straight Jacket Guerrilla Film Festival was founded by UK film director Fabrizio Federico The Ziggy Star Dust of Jett Hollywood who worked with American film director and san antonio video artist Laura Grace Robles Birthday Gurl. These two film directors tokened the fusion of this festival after a circulation of anti art art film, fluxus and Pink 8 philosophies concerned with uniting America’s junk film Texas outlaws with the punk cinema movement of the UK. Together their ideologies progress carrying out the DIY surge for lifting anarchy on a mission to rebel against institutionalized cinema. Naked potty films bring a diverse audience to the Straight Jacket screen sharing a vision that connects any caliber of spectators. Uniting film makers to celebrate the uniqueness of their outsider films coming together as one perfect utopia of talented individuals with shows from all around the world.